Powers/Abilities: Eli had vast scientific and mystic knowledge he used to build weapons and other technological wonders like his battlewagon. If he wasn't driving around in his battlewagon he was bound to a wheelchair since he had lost both his legs at some point in the past. His battlewagon possessed a powerful laser. (Spirits of Vengeance#12 (fb) - BTS) - Eli knew that he was soon going to die, but instead of blaming Blaze, who was the target for all the supernatural threats attacking the Quentin Carnival, he tried to help him as good as he could with his scientific and mystic knowledge. He contacted his son Quinn to tell him that Blaze was soon coming to his cabin. (Spirits of Vengeance#1) - Eli and other carnies welcomed Blaze back at the Quentin Carnival. He later offered to help Blaze when his children were abducted by the Lilin Blackout, Pilgrim and Creed, but Blaze didn't want to put the carnies at risk. (Spirits of Vengeance#2) - Eli was among the carnies that protected Blaze from Steel Vengeance. (Spirits of Vengeance#4) - Eli examined Blaze's motorcycle and shotgun and couldn't find any logical explanation how they worked. Eli later met with Blaze, Wolf, Kody and Clara to talk about the Carnival's future. Clara told them that their supernatural problems had just begun. (Spirits of Vengeance#6) - After Clara had collapsed, Eli, Wolf, Kody and Miranda took care of her. Eli asked her if she could remember what had happened and she told them about a vision that showed all their deaths. When she went into convulsions Wolf told Eli to call a doctor. (Spirits of Vengeance#7) - Eli and the others were still with Clara in her trailer when Blaze returned. Clara told them that their enemies had arrived. Blaze told Kody and Wolf to get Clara, Eli and Miranda to safety when Styge's demons, Steel Vengeance and Steel Wind attacked. (Spirits of Vengeance#9 (fb) - BTS) - The carnies continued to fight the attackers when Blaze and Ghost Rider (Ketch) went missing. Eli used his intellect to outfit the carnies with weapons and worked for 24 hours on them. (Spirits of Vengeance#9) - Eli continued his work when Blaze and Ghost Rider returned. He assured Blaze that his weapons would take out the demons when they returned. He also told Blaze to see him as soon as possible because he had something for Blaze he would be needing soon. When the demons returned Eli joined the fight in his high-tech battlewagon. 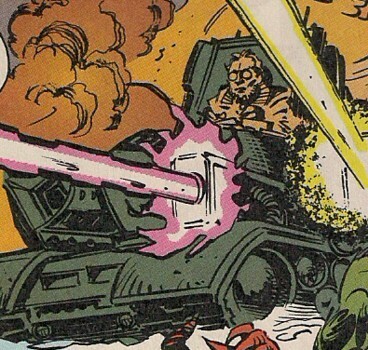 (Spirits of Vengeance#10) - During the battle Eli used the laser on his battlewagon against the demons, Steel Wind and their new ally Vengeance. He ultimately fell prey to Steel Wind, who impaled him from behind with her claws. The claws went right through his vehicle's seat and chest and got stuck after Blaze shot of her arm. Though Blaze rushed to him, Eli's injuries were fatal. With his last breaths he gave Blaze an envelope that would point him to a certain direction (the location where Eli's son Quinn lived) and then told Blaze to save Miranda's son Timmy. After the fight had been won Blaze carried Eli's corpse from the battlefield. (Spirits of Vengeance#12 (fb) - BTS) - Blaze left the body behind and soon the government took control over the carnival's former camp with soldiers and scientists. (Spirits of Vengeance#12) - Blaze, Ghost Rider, Kody and Wolf returned to the camp site and Blaze went looking for Eli's body. When he found it he gave it to Kody and told him to go to their rendezvous point. Some time later Kody arrived with Eli's body, Miranda, Clara and Wolf at Quinn McIntyre's cabin in the woods. Quinn led Blaze to a box with Eli's holographic last will. Eli left several gifts behind for Blaze. Quinn revealed that his father knew he was going to die. A short time later Eli was buried at a nearby cemetary. (Spirits of Vengeance#20 - BTS) - Blaze destroyed DNA samples from Eli and other deceased Quentin Carnival members at a secret military base in the Adirondack Mountains. Comments: Created by Howard Mackie & Adam Kubert. Eli's face was on the cover of Spirits of Vengeance#20, but he wasn't among the vengeful ghosts that led Blaze to Styge's demons and Steel Wind inside the secret military base.